On the way to the first show for the Midget I realised that I’ve probably done more miles in the Midget in less than 2 months than I’ve done in 10 months in the Porsche. Anyway, the sun was out and we popped down to Helmingham Hall for their annual classic car show. Despite arriving earlier than usual we were at the back and next to a Cobra replica and some glorified Beetle – well it only had 4 cylinders. 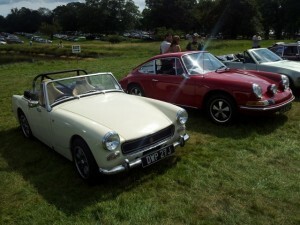 We had a chat with a few other Midget owners and didn’t get hung by any purists either. Car of the show for me was a nice usable 911 and closely followed by a silver Scimitar GTE. We arrived home in one piece then after a cuppa Louise had her first drive in a car that is older than she is. 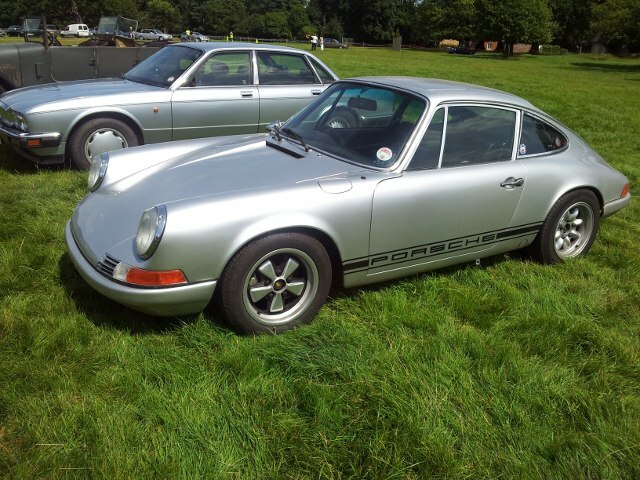 Going from a Boxster to a Midget is a bit of a shock but she also found that after a few miles it had a fun factor but in a different kind of way to the clinical efficiency of a Porsche. Annoyingly she also had the first wave from a fellow MG driver.